Built in 2002 and expanded to include a spa in 2007, Teton Mountain Lodge, located less than a mile from the entrance to Grand Teton National Park, is simply an oversized log cabin with all the amenities to make your wilderness vacation more memorable. This authentic log structure is filled with natural stone fireplaces, spacious guest rooms in cabin dÃ©cor and all things warm and cozy designed for families on vacation. The hotel itself reaches five stories, with the Teton Mountains as a natural backdrop. As you drive up to the hotel, kids will be delighted at the family of black bears, carved out of logs, greet them at the entrance. 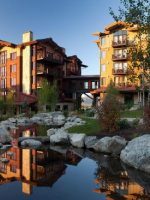 The Teton Mountain Lodge is five levels with 145 guest rooms, condominiums and suites, all decorated to reflect the natural beauty of the region. If there's someone super tall in your family whose toes are always hanging off the bed, you'll appreciate that many of the rooms are equipped with extra-long double beds. Ask if it's something you need. A nice touch for parents traveling with infants: Each room has a lovely rocking chair for getting the baby to sleep. Cribs are available at no extra charge. Boot dryers are located in each closet for use during ski season, too. The Studios are cozy and include Murphy beds and sofa beds, as well as a kitchenette with your basic needs for preparing a meal. The Lodge Rooms are simple units that comfortably sleep two adults and two kids. A mini-refrigerator is included in the room, along with a Whirlpool tub. 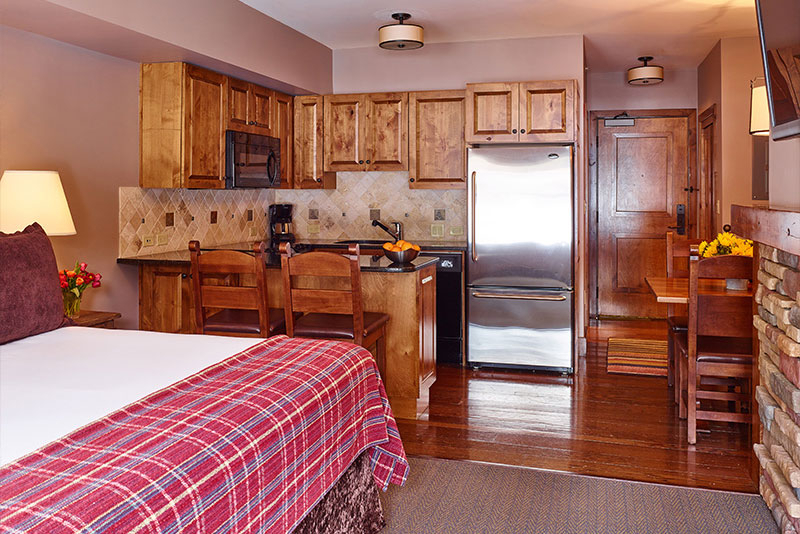 A nice step up is the Junior Sundance Suite, which includes a kitchenette and a fireplace. If you're visiting in the winter, a fireplace is obviously essential! Full-size kitchens are included in the one-, two- and three-bedroom suites. Some of the suites are two levels and include a spiral staircase. Some of the suites have Murphy beds in the living room as well. Kids will love these options. For those rooms with kitchens or kitchenettes, daily housekeeping services are included in the room price. What a beautiful resort! So easy to access the mountain for skiing. Huge fireplace to warm up to afterwards! We went in March and the first night here there was a free outdoor concert within minutes of walking from our hotel. Spent the next two days skiing and eating yummy food. The restaurant in the hotel is great for dinner, breakfast was okay. To top it all off, there was an outdoor hot tub that seats 12 or so. Beautiful views of the mountain. 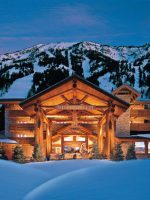 As an avid skier, I have been to Teton Village multiple times staying at different properties. 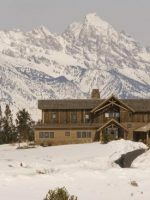 The Teton Mountain Lodge has been by far the most exceptional for customer service and hospitality. From the front desk to the cleaning people, everyone has been friendly and accommodating. I will definitely return upon my next visit. The Teton Mountain Lodge is located smack dab in the middle of one of America's most magnificent playgrounds, so just about any outdoor activity your family can imagine is available here. Because of this, the lodge does not offer a children's program. However, the Teton Village offers a licensed child care program called Kid's Ranch within about a block of the hotel. It's open only in the winter months for those who are toilet-trained and at least three years old. Ask your concierge when making reservations. 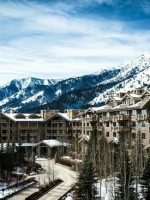 Most families come to the Teton Village in the winter months to enjoy almost 4,000 vertical feet of skiing and snowboarding terrain. Snowshoeing and Cross Country skiing are just out the back door. If you choose to leave the property, you can take the kids dog sledding, snowmobiling in the national forest or on a sleigh ride through the National Elk Refuge. In the summer months, the concierge can help make arrangements for river rafting, hot air ballooning, four-wheeling and more. Hire a guide to go trout fishing or a wildlife guide to lead you to the best spot to safely watch a momma bear and her cubs strip a berry bush for lunch. Much of the good summer stuff is also available without moving your vehicle from the convenient and free parking at the Teton Mountain Lodge. Hiking, horseback riding and mountain bike riding are at their best here on the mountain. You'll have a hard time getting the kids away from the bungee trampoline, the rock climbing wall and the swing sets. There's also a fun spray ground and programs in the nearby amphitheatre almost every summer night. The lodge has two swimming pools -- inside and outside. Both are open all year long, so yes, the outdoor pool is heated. They are simple lap pools, about four feet deep with a large deck. Both pools have a handicap-lift for anyone in your family that might need some assistance joining in on the fun. Most of the time, the rooftop deck and 24-person hot tub is restricted to those under 18, but quite frequently, the spa director will bring his personal telescopes out for a bit of stargazing. Those nights are announced and kids are welcomed to join in. Located in the grand lobby, breakfast and small plates are available at this casual dining option next to the fireplace. 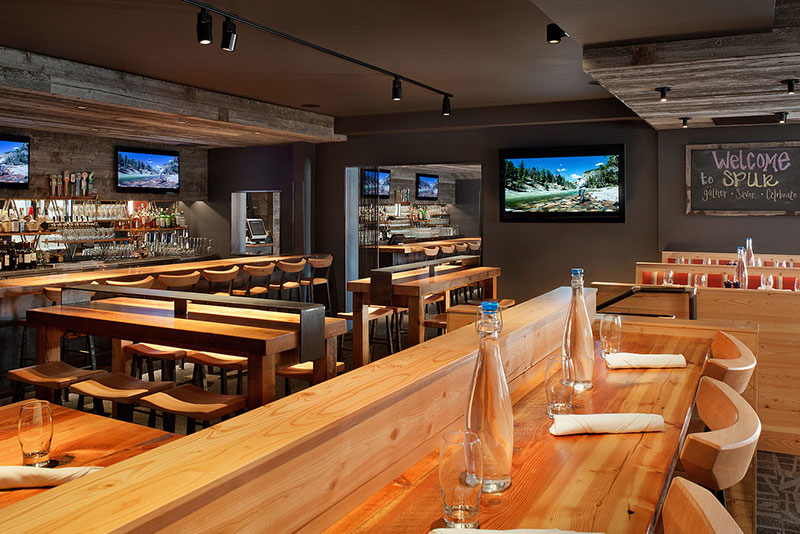 One of the premiere lunch and dinner spots in Teton Village, the Spur was remodeled in the fall of 2012 to enhance its already rustic, western atmosphere. In the summer, floor to ceiling windows open to a terrace adjacent to a creek that runs through the Village. 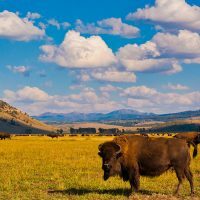 Menu choices reflect the American West with bison, quail, trout and elk highlighting the choices. But your kids shouldn't freak out. Small salads, fruit and vegetable plates, and of course, your staple burger and fries are also options. 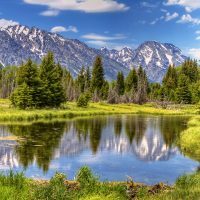 With so much to do and see in the Jackson Hole area, some families might benefit from picnic breakfasts and lunches. Check out the menu for boxed breakfasts and lunches, and maybe even plan a sunrise outing with the kids. A spacious, inviting family room on the lodge's lower level is a great place to hang out with a good book or a board game. Oversized chairs, a fireplace and a game area stocked with books and board games are just waiting for you. Placed strategically on a bed in each guest room or suite is a delightfully cuddly, stuffed black bear. They are for your children's enjoyment throughout your stay. Want to take him home? You can, for a fee. Kids will also love the DVD players that are in all rooms and the huge library of videos available at no extra charge in the lobby. Game consoles are for rent as well, and each bedroom is equipped with iPod Docking stations. The whole property has free Wi-Fi. Grocery stocking services are also available. Babysitting and nanny services are abundant throughout this resort community. The staff at the Teton Mountain Lodge has pre-screened many of the sitters and will make a recommendation that should suit your family's needs during your stay. The gym is open to anyone over 14 years old. The same goes for the Zumba and yoga classes. The Mountain Lodge Store on the first level is a handy service for any personal items you might have forgotten, as well as swimming pool toys, seasonal clothing and souvenirs. But plenty of shops located in the Village will surely fill your suitcase with souvenirs of this trip. The Jackson Hole area is beautiful year-round, but summer and winter are considered the busy seasons. Locals complain that spring is just mud season, so as a result, the Teton Mountain Lodge closes most of April each year. That's when serious renovations and improvements to the property are made. Your best bargains will be early June and early September. 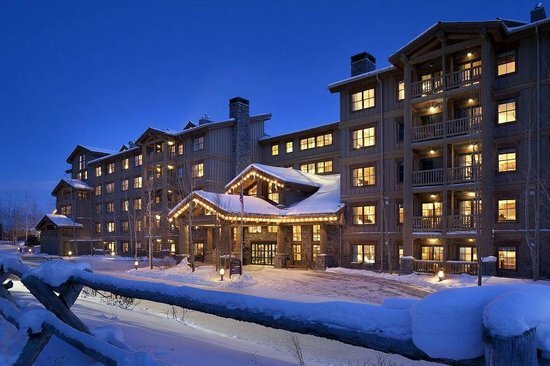 Rooms fill up fast during ski season, so make your plans and reservations early. 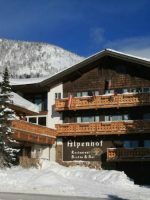 If you plan to spend your Christmas holidays on the slopes, the staff at Teton Mountain Lodge will certainly put a Christmas tree in your room. And if you ship some of your favorite family tree ornaments, stockings or other dÃ©cor items that are special to your children, it will all be decorated, just waiting for your and Santa's arrival. The Teton Mountain Lodge is located in Teton Village, which is about 15 minutes from the town of Jackson in Wyoming. The Village is about 30 minutes from the Jackson Hole Airport (JAC). Delta and United are the only airlines with year-round service. Others add flights during peak season. Families can walk to the Jackson Hole Mountain Resort ski lifts but a vehicle would be needed to visit off-site attractions. 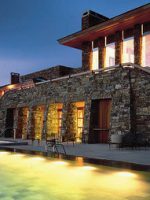 The Solitude Spa is a full service spa that covers three floors and 12,000-square-feet. Included in that are two couples' massage rooms that have fireplaces, hot tubs and balconies to relax before or after your massage. Book plenty of time and perhaps even order a bottle of your favorite champagne or wine. Children are welcome at the spa but anyone under age 16 needs to have a parent's permission before having a massage. Little Fingers/Little Toes is a manicure and pedicure package for those 12 and under.